Looking for an organic antiseptic? Let Tea Tree Organic be your answer. Tea Tree Oil can aid in treating acne, dandruff, and other skin related issues. Properly diluted it can be added to your shampoo, creams, and soap with added benefit. 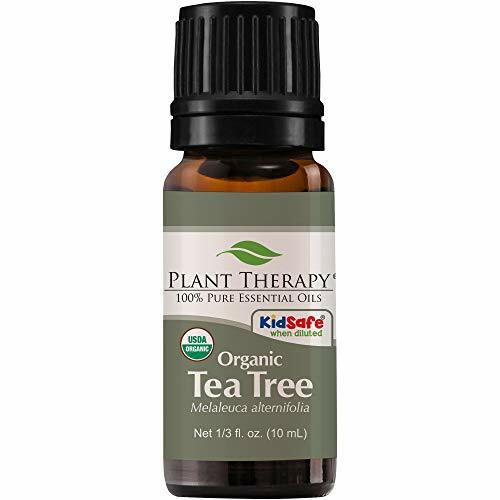 Tea Tree Oil is a safe, natural and organic alternative to help tidy and clean your home as it acts as a natural antiseptic and antibacterial agent. It’s an all-natural antiseptic surface cleaner and refresher especially in steamy, musty areas like the bathroom. Known as Melaluca Alternifolia, our Tea Tree Oil is 100% organic and is produced by steam distilling Tea Tree leaves – a plant natively found in Australia. Add it to your arsenal to help treat skin issues, even face blemishes like acne. Create a skin-soothing salve by blending 9 drops of Tea Tree Organic and 9 drops of Lavender Organic with 2 tbsp of your favorite Plant Therapy carrier oil and apply to the areas of concern. For skin blemishes, dilute to 5% and apply directly to the blemish. It is also a powerful dandruff fighting compound that can be used to make tea tree infused shampoo for healing your scalp. Suffering from fungal infections? Our essential oil acts as an effective anti-fungal solution that can dry up the moisture that makes fungus grow. We offer a vast selection of oils and blends in a variety of sizes. The 2.5 mL, 5mL and 10 mL sizes are the perfect amount to test the waters. Our 30 mL bottle is a popular size for those that know just how well our oils work. The 100 mL value size is cost effective and easy on the budget. For ultimate convenience, try our handy Roll-Ons.